OPC is a mixture of very specific oligomer pro cyanides, hence the name. It was patented in the USA and has a number of functions crucial for life. It is a highly effective antioxidant in itself and multiplies the effect of vitamin C. It reduces infections, improves the circulation and promotes body flexibility through its ability to bind with collagen. It therefore has an anti-ageing effect and works like an "oral cosmetic". It protects vitamin C from oxidising to a dehydro-ascorbate. It prevents the formation of histamines. It strengthens the capillaries, arteries and veins, and improves joint flexibility. It is non-toxic and has no damaging side effects whatsoever. OPC is evident in the entire body an hour after intake. Storage and processing often destroys OPC in food. As a free radical absorber it is 20 times more effective than vitamin C. It has solved the riddle as to why the French have such a high life expectancy despite living a rather unhealthy lifestyle. OPC can be found in high concentrations in red wine, which is regularly consumed in France; it is, however, not found in white wine. This is because only red wine is fermented with the stems and the pips. It is in this phase that OPC is released from the grapes. 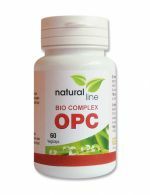 OPC regenerates vitamin C which has been "used up" during free radical absorption, and vitamin C regenerates vitamin E which has been used up to such an extent that a smaller amount is sufficient to achieve the same result. OPC prevents blood platelets from adhering to each other or to the walls of the arteries. The strength of and lack of damage to our capillaries is a major factor in our health. A person is as old as his blood vessels, and this is where OPC can act as a considerable prophylactic. It can also be a significant aid to varicose veins. It also removes oedemas and inflammations and delays the ageing process of the skin. OPC is also an excellent sunscreen as it prevents the effects of free radicals released in this way. It significantly improves the function of the brain and helps with hay fever and stress. It optimises vision and is especially ESSENTIAL for smokers as smoking multiplies the free radicals, resulting in many harmful consequences. One capsule contains: vegetarian cellulose (vegicaps), 50 ml vegtable OPC, 230 mg acerola vitamin C, 100 mg maltodextrin, 20 mg natural vitamin E, gluten-free.